I have been through more than one person should be through…and am as far as I am today because of books. It wasn’t “people” who helped me get here; it was the books that I came in contact with, such as Dare to Take Charge. Since doing book reviews for Simply Stacie, I have learned to become a fan of the introduction pages, the about the author pages, the conclusion pages, and the pages that are outside of the main chapters. This book is no different, especially if you look at this book as a way to help you through things. A person can’t go through all of life’s lessons by themselves; they need a place to learn from others. 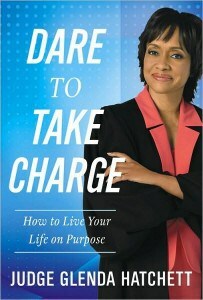 Judge Hatchett’s book does just that, it gives you people she learned from along the way, in lessons you can take to heart in order to improve yourself. She has also been through her fair share of things, each one of us is unique where that is concerned. Yet for once, the focus is not on anyone else, it is on YOU and what YOU need and want. From the very first chapter and reading about Aunt Frances, to the end of the book and reading about her in first grade, this is a great book. Each chapter has a great section at the end, to help you ponder over, and write things down. It has a “dare to” section also with things to think about. Give this book to a teenager ready to go to college, so they can learn from the lessons presented and build their life right the first time. For me personally, I am rebuilding my life, and making sure I am doing it right this time! Be ready to think, to plan, to look at things differently, to DO things differently…and to get your life back, or the one you want anyway! I have certainly not done things the way others would have, but I am doing what I need to do…nothing more, nothing less! This is my honest opinion about a wonderful book I would give 12 out of 10 stars on!